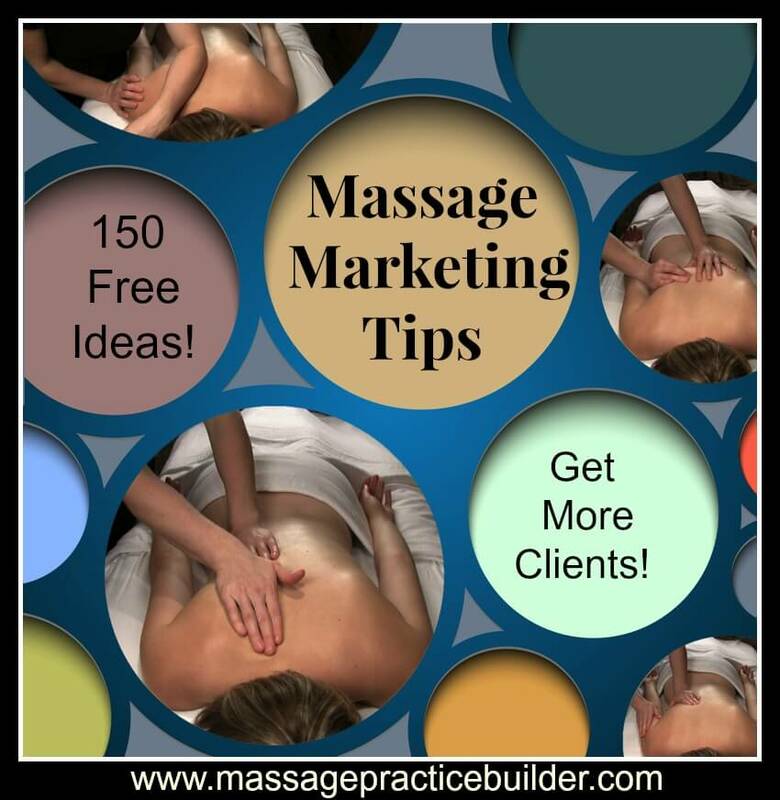 Massage Marketing Tips : 150 Free Ideas! Marketing Massage is a combination of knowing what it is that you do and what solution you provide for clients and letting them know about it. I am creating the biggest list of massage marketing tips for massage therapists to implement in starting and building their massage business. The thing about this list is that there are as many ideas for marketing massage as there are people in the world. It is really just a matter of finding what you want to do and taking the steps to make it happen. Create policies and procedures that will support you and help you make better business decisions including a cancellation and no show policy. Write a letter about what you do and send it to everyone you know. Send it to the businesses around you. Have an open house and offer chair massage and free prizes. Try Groupon or other group buying programs. Give presentations on stress, massage or other health conditions. Choose a niche to specialize in – working with fibromyalgia clients, pregnancy massage, sports massage, injury massage. Write a letter to doctors and others who specialize in those areas. Call one doctor/health care professional a week. Make an appointment to go and visit their office. Ask more about them to start with and if you like them enough start referring people to them. Specialize and become a mobile massage therapist focusing on high end hotels. Go to fund raising sports events like walks, runs, relay for life, the 3 day cancer walk and volunteer your services. Create a sidewalk sign to put outside your business. Create a website. Make sure you research this before starting and learn how to get your website found. A website that can’t get found isn’t worth it. Make sure it has a domain name that tells what you do and where you do it quite simply. That is good for readers so they don’t have to second guess what you do and for search engines. Use your website to educate clients. Set up an online appointment system. Create a newsletter with sign up form on your website to collect people’s names and email addresses. Offer a free report to get their name and email address and follow up with an email asking them question about the subject and what problems they might be having. Use Twitter to announce your last minute openings and put a Twitter feed on your website too. Use Facebook to network with other businesses in your area. To best learn how to use Facebook, follow a few people who are using it successfully. The idea is to post things to your wall and discussions to get people involved and asking questions. Create engaging titles for your posts that create interest. See my Facebook Fan Page for my websites. Write new articles on your website weekly until you get the number of clients you want to be getting. Write about how massage works, how muscles work, about various diseases and conditions that work with massage. Site research and articles. Have a questions and answers page or ask the massage therapists page on your website. Do a short video and put it on your website through Youtube and just talk about what solution you provide. Use keywords in the file name at Youtube that say massage, your city. Learn to use keywords throughout your website and in the metatags of your site. If you can’t do it yourself, invest in having a website done for you. Learn that spending money on your business is required. Figure out your Money Autobiography. Use your website to promote other products such as theracanes, massage tools, massage equipment and make sure you are making money while you do massage. Create other streams of income from the internet. Write ebooks, print on demand books, offer mentoring of other massage therapists. Join the local Better Business Bureau. Join a local business network. Learn about research and what is the latest news. Learn to analyze research and what it really means. Learn about how to talk about what you do. Create an elevator speech that tells what you do – what is your core message – in a few sentences. Connect with local hotels and put your business cards in hotel business services listings. Connect with your local visitors bureau and get listed in their directories. Use one of your own hobbies to connect with people and talk about how massage can help them – knitting groups, book clubs, women’s groups, men’s groups. Start your own peer group to get the support you need. Get a massage yourself once a week. Learn to do a thorough client intake form so that you can provide the best solution to their problems. Ask people when they are leaving to book another appointment. Use gift certificates for various holidays – mother’s and father’s day, Christmas, Birthdays, weddings, graduations, anniversaries. Have special offers for various awareness weeks – bike to work day, breast cancer awareness week. Talk to one person a day about massage. Get involved in your community in other ways not related to massage- park clean ups, homeless advocates, local events. Set up a spending plan that tracks your income and expenses. Include in it your dreams and aspirations as well as plan for taxes, unexpected expenses, vacations, sick days, time off. Work on uncovering your unconscious beliefs about money and being successful. Learn how to set your fees for success. Learn how to create boundaries such as cancellation fees and no show fees and enforce them. Get help in doing that in supervision. Send a follow up postcard to people a few weeks after their session if they have not rebooked. Call your client the day after their session to see how they are and ask them to book another appointment if they haven’t already. Don’t talk during the massage sessions. Focus on learning to be more present in your massage sessions. Learn to bill insurance companies. Create a network of doctor referrals. Teach massage classes to families, friends, church groups. Read as many business magazines, books, articles as you can. Add services to your list of things that you do. Offer a free 20 minute phone or in person consultation. Create a massage research study and look for grant money or provide low cost massage to participants in the study. Offer clients $10 off their next massage for writing a testimonial on Google Local results or any of the review sites and also on your own website. Get a booth at a health fair or job fair. Do chair massage for weddings, conventions, special meetings. Do chair massage for parties. Offer a special foot massage or other shorter service to get people to try your services. Offer 1/2 hour sessions at full price to let people try your services. Make up referral cards so that you can give them to clients to give to their friends and offer a free massage or something to clients who promote your services. Raise your rates every year. Be available but know how to set boundaries that support you and increase your level of integrity. Boundaries help build self confidence. Learn to take soap notes and track your clients results. Show them the results each session. Know when to fire a client. Understand the lifetime value of a client. Being successful means creating repeat business. Offer personalized gift items such as Biofreeze, a massage tool, or aromatherapy product. Donate gift certificates to fundraisers. Give the highest level of customer service at all times. Create your own code of ethics. Keep your office clean and professional looking. Let clients bring their own music and have a way to hook up Ipods and other media into a stereo. Have clear signs for your office to attract attention. Keep clients informed through email or postcards. Call people back within an hour or two at most. It will be impressive. Call clients that you haven’t seen in awhile and let them know you have an opening that week. Keep a file box or list of your marketing ideas so you can do something in between clients every day. Give people handouts when they leave with instructions for follow up, stretching or info on their disease or condition and what massage can do. Send people a review of their session and your treatment plan. Offer free lunchtime classes on meditation or relaxation or breathing exercises. Attend massage conferences and network with other professionals. Develop a new client information kit with info on your business, a few business cards and resources. Look at your underlying issues regarding helping and why you have a need to help. Take a look at the reasons why you became a massage therapist. They are usually the same things that lead to burnout. Self care is needed. Practice regular self care. Figure out what self care means to you! Change your voice mail box every day to let clients know you have an opening that day and that you are in that day. Go to a chiropractor or other health care professional that you would like to get referrals from and become their client. If you want them to send you people, send them some first but make sure it is someone you would want to go to yourself -let along send a client to. Go to other massage therapists too and get regular massage so you can refer to them too. Yes, I recommend referring to other massage therapists. Every client is not for you! There are enough to go around! Choose a massage business name carefully. Some names can conjure up other images for male clients. Make it professional. I recommend that it include the words massage, your city. That way you can create a website around that same name which is one of the keys to search engine optimization. Start thinking of your work as a business not just helping people. It must be profitable in order to stay in business and keep it going. Learn to combine business with being of service. Get over your fears of charging for your work. You are actually charging for your time. What is it worth for you to be away from your family and life? Know who your client is when you are doing all of your marketing. Put yourself in your clients shoes. Actually go out and find a massage therapist for yourself. What makes you choose one person over another? Stay connected with your inner being, source or whatever you call it. Do something for yourself everyday that helps keep you connected – yoga, meditation, walk, listen to music, write in a journal, do tai chi or other movement therapies. Practice gratitude. Not only be thankful but feel it! Be committed. Just doing one promotion one time and not getting any clients is failing. Do it again and change one thing until it does get you the clients that you need. Know what the real benefits of massage are and how to talk about them. For each benefit you know of ask so what? until you get the feeling that you want to cry or are deeply moved. Most of the benefits of massage that people list on their websites and brochures people don’t know what they are or what they mean. Talk to clients without technical terms like the names of muscles and bones or physiology. Explain everything in simple terms so they understand. Use the back of your business card to draw people to action. Refer them to your website or to make the call for an appointment. Have hats, tee shirts, polo shirts that have something about getting a massage on them. Wear them yourself around town or give them to clients to wear at their health club or yoga class. Give them a referral card that they can give to people if they ask. Sponsor an athletic team or community event/fundraiser. Go golfing and take lessons from the golf pro (if you like golfing). Connect with them and tell them you will refer people to them. Ask them to refer to you. Write articles for your local community newspapers on massage and health. You don’t have to be a writer. Just write the way you would talk. Become an expert in a specific area. Connect with businesses and offer your services for promotions or special projects they are working on. Read your local newspapers business section and watch for people who just got promotions. Send them a congratulations. Ask your current clients to put up a flyer in their lunch room or other employee area. Ask your current clients for referrals by directly telling them you are available. Assure them that you will keep an opening for them. Schedule people in regular time slots – the same day, same time for easy rebooking. Decorate your office with artwork from a local artist and let them sell their work through your office. Use the yellow pages especially the online version. Have pens made with your name and phone number on them. Give them to people as they write their checks to you or sign the credit card statement. Look into taking credit cards if you don’t already. Connect with your favorite local lunch spot or cafe and invite the people that work there in for a discounted massage. Use your clients name during the session and afterwards to show that you care. Have a feedback form on your website or send a feedback card after their session. Most people won’t tell you the truth. While the list could really go on and on and I am planning on adding to it as I go but the thing is even with all of these ideas the thing is implementing them and following through with them which involves clearing your own resistance to success and ideas about making money. Brilliant and very accessible tips Julie! Exactly what I was looking for to start putting together my business plan. Thank you for the good idea . God bless! Brilliant piece of information. Once I started reading I enjoyed it till the end. Perfecto for any one starting a massage business or a therapist job. Well keep me updated with such information. Thanks so much! I refer back to this on a regular basis. I have to say, as well, that this is exactly what I was searching for, a massage “mentor” in a message! Thank you. Hi I would like to start my own mobile massage therapy ..thank you for your help About the tips. I am about to start. But am little worried. .I wonder if I will get positive response. .its a good business of course. How many people can I start working with. .staff? Thanks for such a great article. Well it is true that just like any other business, massage therapy business also needs proper marketing skills for you to achieve the best out of it. Starting by commanding a great marketing space to doing the right advertisements, massage therapy business is not for the faint hearted. What experience has taught me is you should put up your massage business in a great location, you should employ the best, you should make sure the business is registered, you should keep an eye out for affordable marketing strategies including email marketing, fliers, and use of social media platforms. Thank You so much for the time and Love that you put into your work and website. I will definitely be sharing! #121# really on the point, thank you, now I know what is my ground! Wow just what I needed thank you so much I’m ready to start my mobile spa therapy. And I totally agree with Adolf (above) a “massage therapy business is not for the faint-hearted.” LOL. All these tips will definitely give you a powerful marketing strategy to build that strong financial foundation. Thanks for this! Thank you for sharing your great ideas for a massage business. You shared AWESOME ideas! This should benefit many massage therapists. This is some really good information about massage therapy marketing. I liked that you pined out that it would be smart to try to join a massage association. It does seem like would help people who are serious about getting massages would check stuff like that. As well as people who need to get messages to recover from an injury.